03/19/19- (written by Aitanna Ferrez) Joaquin “El Chapo” Guzmán was convicted in the Southern District of New York on Tuesday, February 12, 2019 on all counts brought against him for his role in directing the Sinaloa Cartel since roughly the 1980s. The trial revealed significant details about the Sinaloa Cartel, how it works, who is involved and where their business is conducted, providing a greater understanding of how this specific cartel has contributed to corruption and violence in Mexico. In the wake of his arrest and extradition to the United States, business of the cartel seems to be carrying on as usual, there is an ongoing epidemic of U.S. drug overdoses, and violence in Mexico has reached record levels. Understanding the impact of the Sinaloa Cartel and where it may be headed in Guzman’s absence requires a careful review of what we now know about the organization. According to InSight Crime, the Sinaloa Cartel began as a small group of farming families who switched to drug trafficking in the 1960s and 70s. In the 1980s, Joaquin “El Chapo” Guzmán officially founded the Sinaloa Cartel. Up until his arrest in January 2016, Guzmán served with Ismael “El Mayo” Zambada Garcia as what has been perceived as head of the drug trafficking organization. The Sinaloa Cartel achieved success in part because of its relatively decentralized structure, with different geographic divisions of the network working together as “separate but cooperating organizations.” Indeed, though identified as the organization’s formal leaders in principal, InSight Crime reports that both Guzmán and Zambada Garcia historically maintained their own individual organizational structures within the Sinaloa Cartel. Meanwhile, many of the Sinaloa Cartel’s activities and operations in Mexico and internationally were “outsourced” to local suppliers, distributors, and other partners. The effect of the reach of the Sinaloa Cartel and its network of contraband trade has had translates directly into its ability to, as InSight affirms, “successfully [penetrate] government and security forces wherever it operates.” As stated in a June 2018 CRS report, the Sinaloa Cartel has “successfully corrupted public officials from the local to the national level inside Mexico and abroad to operate in some 50 countries,” allowing it to become the top supplier of illicit psychotropic substances in the United States. The trial of Joaquín “El Chapo” Guzmán was a lesson in and of itself on how the Sinaloa Cartel’s success has been contingent upon the high level of corruption within the Mexican police, military, and government. Witness testimony during the trial brought to the surface countless allegations against Guzmán and the Sinaloa Cartel, and corruption was arguably the prominent theme that emerged throughout. The first witness’ testimony illustrated the way that government officials fell under Guzmán’s sway even as they were sworn to enforce the law. Cifuentes, meanwhile, alleged that the cartel was able to bribe officials even at the highest levels of office, including then-president Enrique Peña Nieto (2012-2018), who allegedly accepted a bribe of $100 million to protect the Sinaloa Cartel from authorities. The Sinaloa Cartel, though constantly challenged within Mexico by other drug trafficking organizations, seems to prosper well due to its significant international network, even after the guilty verdict of Joaquín “El Chapo” Guzmán. In an interview with PBS Newshour, Mike Vigil, the former chief of international operations for the DEA, comments that capturing and convicting Guzmán “was a great moral victory for the rule of law, [but] it did very little to have a negative impact on the Sinaloa Cartel.” With the drugs continuing to be shipped, the Mexican government no longer hunting down drug lords, and Guzmán’s fate of little importance, the Sinaloa Cartel seems to continue to persist with business as usual. Beittel, June. “Mexico: Organized Crime and Drug Trafficking Organizations.” Congressional Research Service, 3 July 2018, pp. 1–28. https://fas.org/sgp/crs/row/R41576.pdf. Feuer, Alan. “El Chapo Drugged and Raped 13-Year-Old Girls, Witness Claims.” The New York Times, The New York Times, 2 Feb. 2019. www.nytimes.com/2019/02/02/nyregion/el-chapo-trial.html. Keneally, Meghan. “How El Chapo’s Sinaloa Drug Cartel Spread Its Reach Across US.” ABC News, ABC News Network, 13 July 2015. www.abcnews.go.com/International/el-chapos-sinaloa-drug-cartel-spread-reach-us/story?id=32421054. Robinson, Carol. “Mexico’s Sinaloa Drug Cartel Leaving Deadly Mark on Alabama.” AL.com, Advance Local Media LLC., 23 July 2018. www.al.com/news/birmingham/index.ssf/2018/07/what_is_the_sinaloa_mexican_dr.html. “Sinaloa Cartel.” InSight Crime, 30 Jan. 2018. www.insightcrime.org/mexico-organized-crime-news/sinaloa-cartel-profile/. 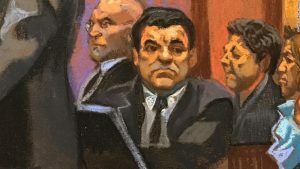 “The Verdict.” Chapo: Kingpin on Trial. VICE News/Spotify. 19 February 2019. https://open.spotify.com/show/3iZGZfoQX9kfzdZtAYi2s2?si=wxEH63CcQD2B50avZt8XJg. Verza, Maria, and Mark Stevenson. “After El Chapo Conviction, Sinaloa Drug Cartel Carries On.” PBS, KPBS, 12 Feb. 2019. www.pbs.org/newshour/world/after-el-chapo-conviction-sinaloa-drug-cartel-carries-on. Verza, Maria, and Mark Stevenson. “Despite ‘El Chapo’ Arrest, Mexico’s Powerful Sinaloa Drug Cartel Still Raking in Cash around the World.” The Japan Times, 13 Feb. 2019. www.japantimes.co.jp/news/2019/02/13/world/crime-legal-world/despite-el-chapo-arrest-mexicos-powerful-sinaloa-drug-cartel-still-raking-cash-around-world/#.XGxRBc9KigQ. This entry was posted in Corruption, Crime and Violence, Organized Crime, Transparency & accountability and tagged "El Chapo", "El Mayo", Guzmán trial, Ismael Zamabda Garcia, Joaquin Guzman Loera, Sinaloa, Sinaloa cartel. Bookmark the permalink. ← New Justice in Mexico and Wilson Center Report: The U.S. Fentanyl Boom and the Mexican Opium Crisis: Finding Opportunities Amidst Violence? Decentralized structure is the key. It works well for terrorist organizations and also for the Sinaloa cartel, which is why it will be business as usual for the cartel post-El Chapo.